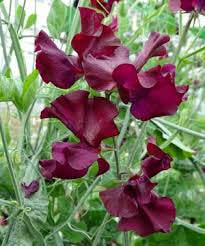 Beaujolais Sweet Pea deep burgundy colored flowers. They will grow to 8' tall and 24" wide. Plant Beaujolais Sweet Pea in full sun and well drained soil. Beaujolais Sweet Pea makes a great cut flower and is easy to grow in containers. Just provide a stick or trellis for them to climb on. Or plant them along a fence to add some pizzazz to the side of your yard. They will bloom from spring to early fall and it will attract butterflies.